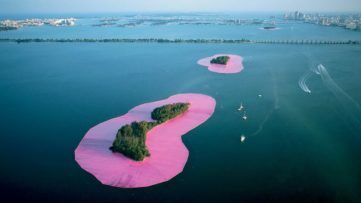 One of the leading proponents of Land Art, Robert Smithson initially flirted with Pop Art by creating hybrid collages made of various elements. 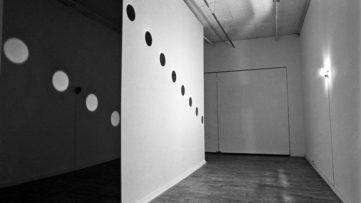 He soon became preoccupied with Minimalism, and was affiliated with artists belonging to the Primary Structures movement, such as Nancy Holt (who became his wife a few years later), Robert Morris and Sol LeWitt. 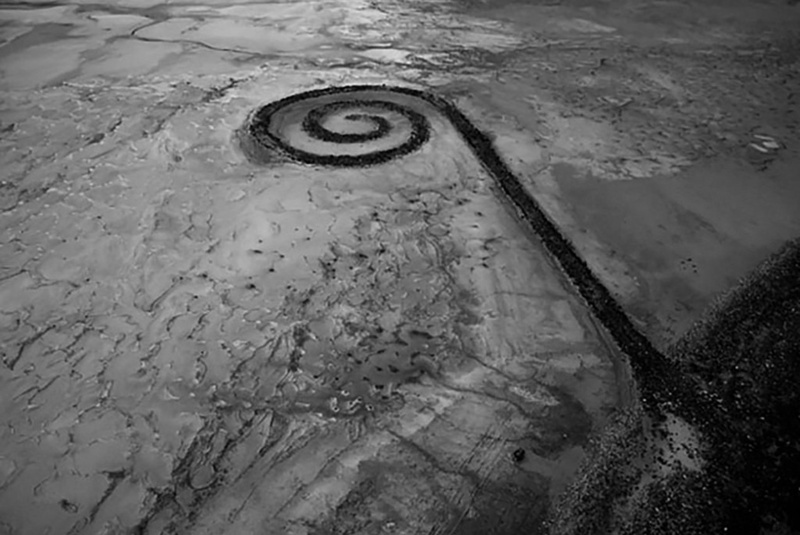 Around 1967, Smithson became interested in sculpture in the expanding field, a term proposed by art critic Rosalind Krauss in 1979, which led him to create one of the pioneering and large scale interventions in the natural environment – the iconic Spiral Jetty in 1970. Before we come to closer to analyzing this land art masterpiece, it is mandatory to examine Smithson’s practice in the context of the seventh decade of the past century. Namely, the discontent with social and political circumstances on a global scale resulted in the student protests in 1968 which nurtured a generation of young people willing to change their societies in a quest for a better world. The student demands were in sync with a broader social climate framed by the Civil Rights movement, and later feminist, LGBTQ and environmentalist movements. Naturally, all of those progressive politics reflected on visual arts, and eventually resulted in the appearance of conceptual art, the leading artistic phenomenon of the 1970s. At the same time appeared a new art movement based on environmentalism and an approach similar to the one of Conceptualism. The leading idea behind Land Art was the use of natural materials such as soil, rocks, vegetation, and water. All of the elements were found in the natural environment and were composed in specific formations, aimed to remain exposed to atmospheric conditions and potential changes in the landscape. These interventions were usually documented with the photo camera, and the photographs of the works were then displayed in an exhibition space. The movement was even promoted in a film made by a German filmmaker Gerry Schum, featuring both American and European artists and their works released in rural sites; the film was transmitted on an independent television called Sender Freies in 1969. One of the finest examples of Land Art was indeed Spiral Jetty, constructed in April 1970 according to the concept of Robert Smithson. It was made of mud, salt crystals, and basalt rocks on the northeastern shore of the Great Salt Lake near Rozel Point in Utah. To be more precise the work, which is 1,500 feet (460 m) long and 15 feet (4.6 m) wide, forms a counterclockwise coil jutting from the shore of the lake. 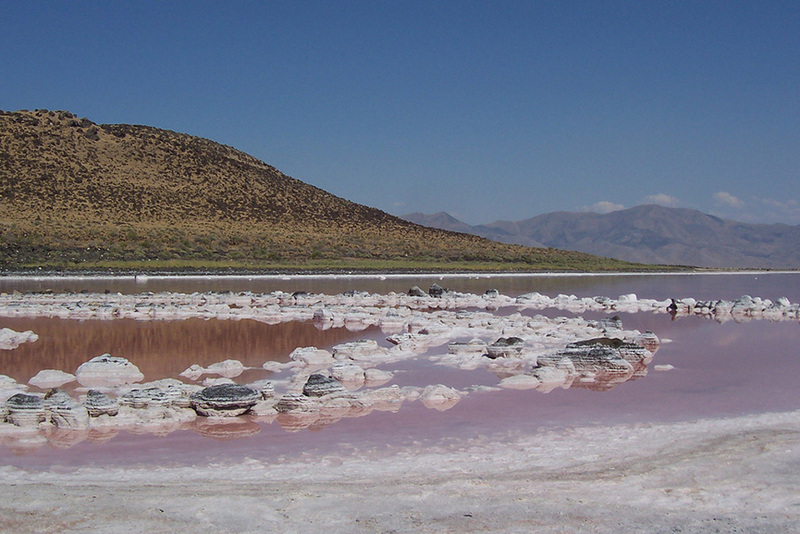 Robert Smithson explained that the location in Utah was chosen because of the blood-red color of the water and its connection with the primordial sea. The salt-tolerant bacteria and algae turned the water red; the lake consists of 27 percent salinity in its northern part which is an effect of the lack of freshwater sources. Another reason for the selection of the Rozel Point site was the artist’s fascination with its desolate beauty – an old pier, few unused oil rigs and industrial remnants from nearby Golden Spike National Historic Site. In order to transfer the rocks into the lake, Smithson hired a contractor Bob Phillips, who was a construction expert and was quite efficient in projecting the cost and effort required for delivering the project. Allegedly, the artist took some time to pursue the contractor to accept the unusual proposal. In order to produce Spiral Jetty, Smithson had to require the approval of land rights and earthmoving equipment. The works began in April 1970, and Phillips used heavy mechanization to pull 6,650 tons of rock and earth into the lake. The project was conducted in two phases – the first lasted six days. Smithson decided to reshape the constellation, meaning that 7,000 tons of basalt rock had to be moved, so three more days were added. Finally, the spiral shape as we know it today was made, despite the fact Phillips was not very fond about using the equipment in the mud around the Rozel Point. Nevertheless, both the artist and the contractor were satisfied and they used the term “entropy” to describe the interaction of the lake and the basalt. 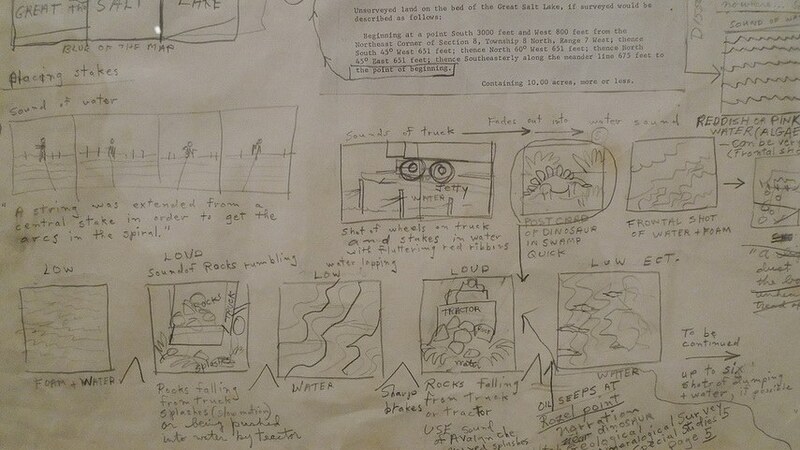 As a matter of fact, Robert Smithson reinterpreted the historical discourse by proposing a new paradigm of artwork outside of an art institution. The sequences shot from a helicopter was an effect of his desire to recapitulate the scale of the jetty aimed to achieve the impression of the artwork outside the categories of time and place. The work is noted as one of Smithson’s best works. Unfortunately, three years after creating it, the artist died in a helicopter crash in Texas. In 1999, the artist Nancy Holt, Smithson’s wife, and the Estate of Robert Smithson, decided to donate Spiral Jetty to the Dia Art Foundation. This independent organization obliged to take care of the work and maintains the lease of Utah sovereign lands in the Great Salt Lake. 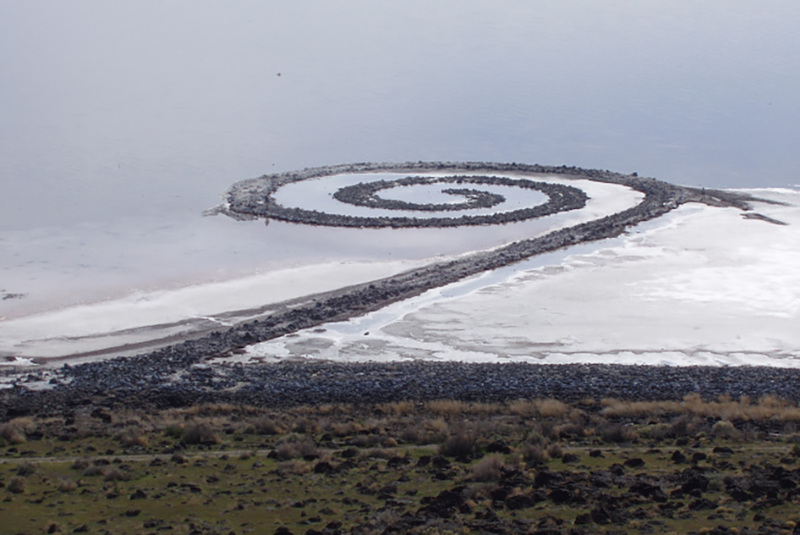 During that time, the work was fully submerged in the lake; n the early 2000s, however, drought caused water levels to lower, so Spiral Jetty became visible for the first prolonged period in its history. Such a natural shift resulted in an increasing popularity of the artwork, so a great number of visitors come to see it. 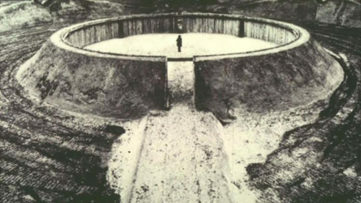 Robert Smithson gave several ambiguous statements concerning entropy and his intent for the work to mimic earthly attributes so that the elements of the work are left to dissolve naturally which makes preservation process very complicated. Whichever is the fate of the Spiral Jetty, this particular land art intervention or sculpture has definitely marked the beginning of a new era and launched an entirely new perception of the function and the meaning of an artwork. 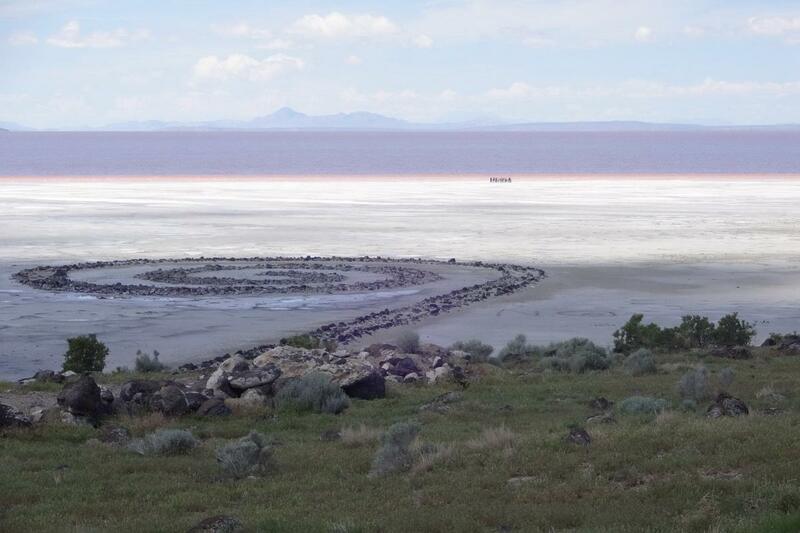 In 1970 Robert Smithson (1938-1973), one of the most innovative and provocative artists of the twentieth century, created the landmark earthwork Spiral Jetty at Rozel Point on Utah’s Great Salt Lake. This dramatic and highly influential work forms a coil 1,500 feet long and 15 feet wide and stretches out counterclockwise into the lake’s translucent red water. Composed of black basalt rocks and earth, the sculpture comprises the materials of its location: mud, salt crystals, rocks, water. The contributors to this comprehensive publication consider the sculpture in relation to its eponymous companions—a text work and a film. These essays situate this renowned series of works alongside Smithson’s critical writings, proposals, drawings, sources, and models. 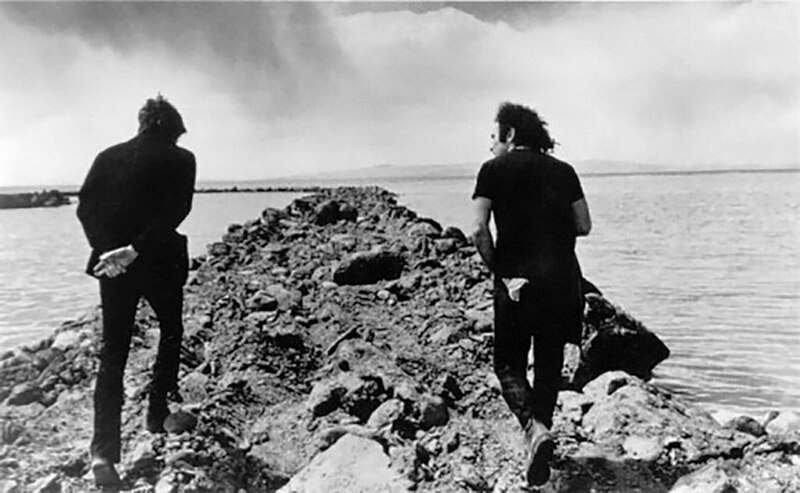 Featured images: Robert Smithson – Spiral Jetty, 1970, by Retis image via Flickr; Robert Smithson Spiral Jetty 1970, via Wikipedia; Robert Smithson Spiral Jetty by Donald Fodness via Flickr; Spiral Jetty from atop Rozel Point, in mid-April 2005, via Flickr.